More than 60 percent of 1,025 parents surveyed in the United States reported they would support age restrictions for tackling in youth football, similar to limits in soccer and hockey. An analysis of the survey results are published in the May 2019 Pediatrics, a journal of the American Academy of Pediatrics. The study, “Parents’ Perspectives Regarding Age Restrictions for Tackling in Youth Football” is now online. The survey was conducted to determine the level of national support from parents of school-age youth for age limits on tackling. Sara P.D. Chrisman, assistant professor of pediatrics, Division of Adolescent Medicine, at the University of Washington School of Medicine and a core member at HIPRC was the lead on the study. She also practices at Seattle Children’s and is a research at its Center for Child Health, Behavior and Development. HIPRC associate member Stanley Herring, clinical professor of rehabilitation medicine and co-founder of the Sports Institute at UW Medicine, and core member Fred Rivara, professor of pediatrics and a researcher at the Harborview Injury Prevention and Research Center, were senior investigators on the project. About half of football injuries occur during tackling. Concern is growing about the potential long-term ramifications of sports concussions. The researchers found that parents who were female, college-educated, and had greater perceived risk for concussion were most likely to support age restrictions. An estimated 63 percent of mothers and 58 percent of fathers would support a minimum age for tackling in football, or 61 percent of parents overall. An additional 24 percent of parents would maybe support a minimum age for tackling in youth football. Only 15 percent were opposed. Football is one of the most popular sports for boys, with approximately five million youth participants in the United States each year. As improvements are made in the safety of youth sports, rules are an essential tool. An understanding of parents’ attitudes towards proposed rule changes can be valuable for shaping public discourse. A few states have proposed or are proposing age restrictions on tackling in football. Some state proposals did not specify an exact age, others have proposed that the youth participants be at least 12, still others, 14, and one suggested that the youngsters be in grade 8 or above. The researcher hope the information gleaned in this study will help inform discussions when guidelines about tackling in youth football are revisited. 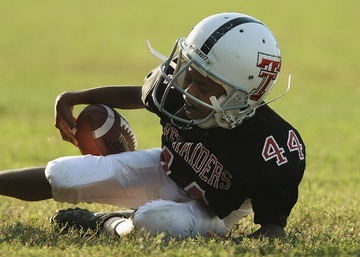 A commentary on the study, Youth Tackle Football: Perception and Reality appears in the same issue of Pediatrics. The author is Cynthia LaBella of the Children’s Hospital of Chicago and Northwestern University’s Feinberg School of Medicine. This release originally appeared on the UW Medicine Newsroom.